GodMode is a feature that was revealed by CNet's Microsoft Correspondent. GodMode is a folder that brings together a long list of customization settings allowing you to change all your settings from one place. 1. Go To Desktop And Right click. 4. 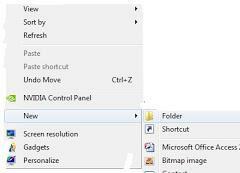 Blink as the folder changes form to look like the control panel. 5. Open the folder and bask in all your godly, control panel-y power. Enjoy God Mode In Windows 7 !